Samples submitted as benzodiazepines to our IDCS are uncommon (2.4% of the total substances tested between 2014-2018). Alprazolam is the most frequent: 79.61% of the 222 samples received in this 4 year period, were submitted as “alprazolam”. From 2016-2018 we received 153 samples that allegedly contained alprazolam. Country of origin is summarized in Table 1. 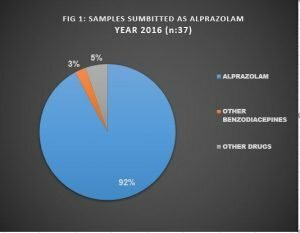 From 2016-2017, 96 samples contained alprazolam as the only active ingredient: 16 pills and 80 powder samples with an average purity of 85.2 +-6.1% . 4 samples contained other benzodiazepines (diazepam, adinazolam, diclazepam, etizolam (n:1) ) and 3 samples contained other substances (fentanyl, ciclopropylfentanyl, N-Ethyl-Hexedrone (n:1). Overall, our results indicated high purities and low adulteration rates during 2016 and 2017. But, at least in samples submitted to our IDCS during 2018 (n:50), this trend has changed abruptly. 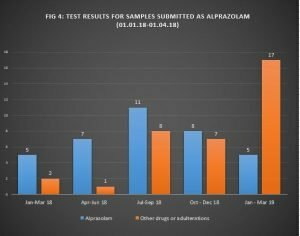 Samples containing alprazolam decreased to 62% , as shown in Fig 3. Table 2 shows a detailed list of substances detected during 2018. 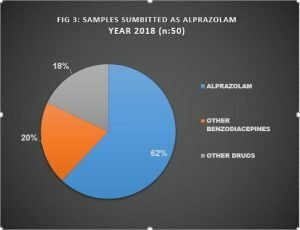 The frequency of adulteration in alprazolam samples shows an increasing trend during the second half of 2018 and the first quarter of 2019, as shown in Figure 4.